Since 2006, I have been doing AMBrc and AMB20 Cell replacing. The price is $30,unit. I also offer the same service to TranX 160 and TranX 260 units. The TranX units run $60 to $80 depending on what version they are and what cell or pack is needed to fix them. Return Shipping/Handling cost are extra. Please CLICK HERE to contact me if interested or have any questions. Be aware that these AMB Transponder Repairs are only to replace the failed or failing cell. If the transponder is otherwise bad, replacing the cell won't fix it. It is also possible to replace the LED's on AMBrc and AMB20 unit for an added $10. 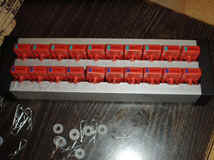 Some LED's in TranX units can be replaced also for $15. On some really old transponders, the LED can get broken if the silicone is too hard and will need to be replaced. Others the LED is so dim you would be better off getting that replace too. I have also seen LED's get cracked in TranX units. Shipping services will not hesitate for a second to add charges to your shipping costs for amounts of said insurance you decide to place on your package contents. These corporate entities, including the US Postal Service, make their own rules to their insurance coverage. Whether those rules will allow the possibility that amount you place for insurance can be paid to you will not be disclosed to you at the service desk when you paid the bill. You are expected to know what their rules are and if you will be covered or not. You can only recover the amount the shipper decides the loss is worth. Whether the shipment is disappeared or completely destroyed, you will not be paid for the loss to the amount you put on insurance for unless you can prove the shipped item/s are worth the cost requested based on their rules. Expect that you will be put through a system to handle your claim that is without human service. This will block you at every turn and delay as much as possible. Trying to get real customer service is very difficult and anyone you do get will just push you off to someone else that you will find will not help you either. Realize what you think your loss is worth means nothing to the shipper. If you cannot show a purchase receipt to prove your loss, your claim will be denied. Even if you do have a valid purchase receipt, unless you just bought the item, expect they will adjust down or depreciate that amount as they see fit and only pay what they decide to, or not. If it was an obsolete item, antique, family heirloom, art item, pictures, or anything you deem priceless and irreplaceable, you will get no more than a default amount no matter what you paid to insure the shipment for. To give you an example, let us say you were sending an antique watch you got from your great, great grandfather to your son and insured it for $1000. The USPS smashed it to bits and you prove that. You would be lucky if they will pay you the default $50 and it would likely take months to get that. Whatever they pay you, as soon as you cash that check your right to get the remaining amount you insured the item for is cancelled. If you are dead to rights, these shipping companies could still decide to deny your claim. Then you will have to sue. In the case of the government, (USPS) you need to do it in Federal Court. Should you win, the costs for the court case including your time loss, attorney fees, court fee and etc., would not be recoverable. I would bet if you read the fine print on FedEx or UPS insurance coverage, those policies would also state they are not liable to pay any costs above the listed insured value. What they would depend on is you would not be able to afford to sue them and just let it go. So, if you want something you cannot live with losing without any ability to recover the loss to get somewhere safely, do not send it out by the USPS or any commercial shipping service without reading the contract and getting it in writing that you will recover the insured value fully without any problem. Being this is not possible, realize you either need to bring the item to the place you want it to go yourself or find someone you can trust to deliver it there for you. You can expect any shipper will do everything they can to avoid paying you the loss you insured your package for. So, how does sending your transponders to me, or anyone else, for any reason, by any commercial service, relate to you? In the case of AMB20 and AMBrc R/C model racing transponders go, if the shipper loses the package or it is somehow destroyed, it will be a total loss for you. It does not matter how much you pay to ensure them for and the shipper will readily take your money for that imaginary coverage without warning you that it is useless. AMB20 and AMBrc transponders are obsolete items. I'll tell you right now, I would not sell you a rebuilt AMBrc transponder for less than $150, but if you sent a row of ten of them to me or I sent them back to you using the USPS system insuring them for $1000, both ways, and they lose or destroy them, you will not be paid the coverage you paid for. The USPS will block you from claim service as long as they can, force you to use only their online claim filing system, deny your claim in any way they think they can get away with, force you to produce dated purchase receipts, pictures of the articles in question, make you jump through hoops following their rules, make you wait for their set time periods before denying your claim, then you must appeal again and again, and etc... So, in the case of a obsolete transponder, in the end, it will only be seen as worth whatever they decide to value it as. It does not matter to these crooks that you may not be able to replace them again now, at any price, and the fact you paid for that $1000 in coverage will not be honored by these crooks because, they do not have any honor nor respect for you at the USPS claims department. After all, we are talking about the US government and we the people are just slaves here to serve them, right? Sorry, got off the main subject on to a reality track. The bottom line is, shipping insurance is a scam. Unless you have a legally valid receipt or appraisal proving the worth of your item/s that is less than a month old, they agree to honor that receipt or appraisal of the amount of value, and you get it in writing they agree to insure to that shown value before you hand it to them to ship out, if they lose or damage your package and article/s, you can expect they will make every attempt to deny to pay you. I can assure you this is all true and expect it is also the case with both UPS and FedEx. So, what does this all mean? Shipping the transponders to me and my shipping them back to you by your choice of shippers, insured or not and at your expense is entirely at your risk. I cannot make these shipping companies honor their failings in any way and cannot assume the loss should they fail causing the loss of your transponders. To date, I have not had any shipping service lose or destroy any transponders in or out of my shop, but I just want everyone to know that if or when it happens, you will see how these corporate companies will not take responsibility for anything and you will be lucky if they pay you a cent. You have been warned be me, a decent, honest and respectable man. I hesitate to call myself a business man, even though I am one, because for many people in the business world, when they get ahead by trampling on others, morality does not apply and screwing others is excusable. I am not one of those people. Thank you for your attention to this matter. I have worked out a good procedure for replacing the 1.2 volt NiMH button cell in AMBrc Rechargeable Transponders that fail naturally with regular use. A new cell generally makes them as good as new again. Don't try this unless you are pretty good with your hands and with a blade. A properly operating AMBrc Rechargeable Transponder should flash once green and then go to it's red LED showing it is in charge mode when you put it in your charging rack. If it does not do this, there may be more wrong with it than a bad cell. Unfortunately, AMB no longer produces the AMB20 nor AMBrc, so your only option is to fix the ones you have or search out used ones that still work. I have very limited AMB20 and AMBrc transponders, but will not let them go without a fight. What I mean is, I am scared to sell them because of my own racing services and if I do let one go it won't be chap. Moving on, a new AMBrc Transponder would flash green for a minimum of 18 hours after fully charged according to AMB. I consider any Transponder that won't flash green for 6 hours due for cell replacement. Don't try to do this if you are not ready to accept failure. The first one I did went dead. I still don't know exactly why. It may have been just a coincidence, but possibly I ground in too deep and damaged something. I now have refined my procedures and have years of practice. In any case, you must have the tools and technical abilities needed to do this job. Good luck to you. I take no responsibility for any damages you do by following these instructions. Here is how I do it. Open them by carefully prying off the battery compartment cover. (The part with the mounting post) This is hard to do without damaging the assembly. I used a small table vise, Exacto knife blades and a very sharp 3/4" wood chisel. First use the Exacto knife and get the cap loose on all sides. I found the assembly is packed with clear silicone rubber glue before squeezing on the cover and this is what holds the cap on. What I found works is to push in the wood chisel on the opposite side the the ID Number is on to cut and pry the back off. You must be careful not to cut into things wrong because you cannot destroy the back cap nor go the other way and break the LED's. AMB will not sell you any parts. Once the cap is removed, you need to start cleaning the silicone off to reveal the top of the two LED's and NiMH Button Cell popping up out of a pool of hard, red epoxy. Use the wood chisel to scrape the silicone out of the cap. At this point, you can now see how these units are built. It looks like they start with the main shell with charging posts installed, slip the component board over these charge post pins and solder these pins to the board. After this, they install the 1.2 Volt Button Cell. The OEM Button Cells I had in my transponders were GP 80BVH NiMH with solder tabs attached to extend past the outer edge for both the positive and negative sides. These solder tabs are soldered to connection posts sticking out of the board for them. The cell is positioned below and between the LED's. If you were to look at the assembly as it relates to how the cell is installed thinking of the cell as the center of a clock, the AMBrc Transponder LED's would be approximately in the 10:00 and 2:00 positions, the negative tab solders to a round post at 6:00, and the positive tab solders to a flat post at about 4:00. AMB20 are laid out differently. The way the AMBrc Transponder is built, they were not designed to be repaired in my opinion. If there is anything besides a bad battery, I doubt even AMB can repair them. They likely just recycle the ID number as usable back into their data base and discard it. I bet they don't even repair the ones with just bad cells because it is difficult and time consuming. After you pry off the back and clean off all of that silicone rubber, you have to chisel the cell out of that hard epoxy without wrecking the solder posts, LED's and/or damaging the board to allow the fitting and installation of a new cell. If you were capable to get to this point, I should not need to tell you how to reassemble the transponder with a new cell. Before you epoxy the new cell in place and seal the case, I recommend you test the unit to ensure it works properly. No sense in wasting a new cell on a failed transponder. My main purpose with this section is to warn people that are considering trying to do their own work on their rechargeable AMB transponders what they are getting themselves into. If you have the needed tools and are very good with your hands in doing delicate work, go for it. If you feel uncertain you can do the job, it is probably best to use a reputable third party service like KRC Products. (Our Company) I have done hundreds of these now and will get you back in business right away. Remember though that if there is more wrong than a bad cell or LED, they cannot be repaired. Also, you can no longer buy these anymore new, only used ones from another site if you are lucky, so take care of what you have. Would you like us to replace your bad Transponder cells? We do this for only $30 each parts included for the AMBrc and AMB20. 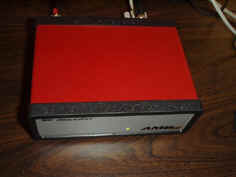 AMB TranX 160/260 are $60-$80 each depending on the versions and what cell or pack is needed. CLICK HERE to schedule our services. Kevin's R/C Products runs R/C races using AMB Race Management Equipment. It can be pre-arranged for me to run events at your location provided there is some profitability possible, I can fit it in my schedule and the location is not too far from us. I have fully mobilized all my equipment by putting everything into a 6' x 12' Cargo Trailer that can set up a race very quickly and professionally at any site. Please click here to contact me for more info. Below is the start-up screen for Autoscore. All of our races are run using this professional race management system. Below is the Rechargeable Transponders used to track lap times of the individual racers and the decoder to process information to be sent to the race computer. The charging rack is both a holder and charger. Racers take the assigned Transponder from this rack and install it into their R/C model before each heat or main and it is held in place by a body clip. AMBrc Transponder and Pick-Up Loop System. This state of the art Timing System is designed to individually accurately track Racers lap times on any Pavement, Carpet or Off-Road event. 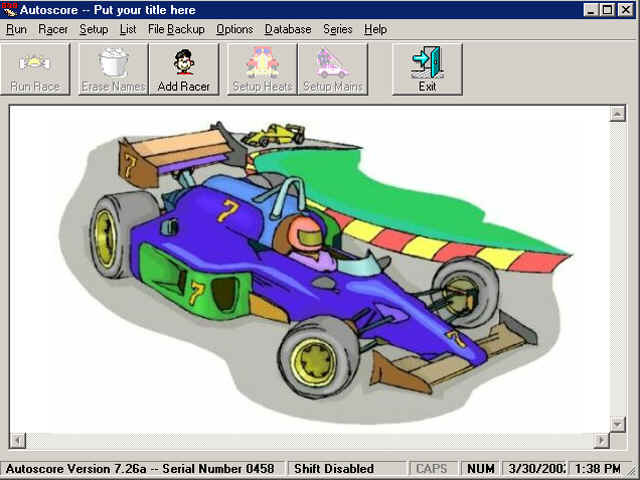 All Races are run using Autoscore Pro for Windows Race Management software. This Professional Program offers complete perimeter flexibility with many options. An unlimited number of participants can enter Races in up to 30 different classes. A maximum of twenty Racers can run in any Heat or Main at once. After all racers are entered into the system, the program sorts the racers into heats avoiding frequency conflicts and other problems. Once the heat setup is successful, the Qualifying Heats are printed out and racing can begin. The Top Qualifier is displayed for all Classes. Up to ten Qualifying Heat Rounds can be run in either using Staggered (IFMAR) or line-up starts. Usually, two or three rounds are run. The program sorts the racers into mains based on Qualifying times. After all Qualifying Heat Rounds are completed, the Mains are set up and printed out. After all Mains are completed, the final results are printed showing all lap times. The club or organization can then have an awards ceremony or whatever is customary. During the races, we have added a Super-Bright Red Pixel LED Display, over 4 foot wide, to show race numbers and times. We also have a second smaller 28" wide unit that can be run into any indoor pit area that may be at the track site. These displays work extremely well to keep any event organized without as much need for blaring out information over a PA system. A track's noise levels are the first thing that will get you in trouble with neighbors causing track owners to find themselves in front of the City Council these days. For races with longer mains requiring fuel stops, we place the 4 foot unit trackside in line of site so that drivers can glace up at it to view the race time remaining to know whether a pit sop is due. Those 4" high letter are readable for up to 200 feet in bright sun light. Generic pictures of the unit below will be updated with ones trackside with them in use soon. Need to get a new R/C model, any parts and/or equipment? CLICK HERE TO GO R/C SHOPPING NOW!